Sport is not the first thing one thinks of when considering the Intaki people. Most likely, the average denizen of New Eden has only a cursory understanding of this old and widely spread civilization, and stereotypes prevail in such understanding as they do everywhere else. Yet the Intaki are not a people so utterly reserved and diplomatic that they cannot enjoy rivalry in good humor nor so spiritually aloof that they cannot admire physical prowess. Indeed, the Intaki are a people like any other, possessed of calm and energy, wisdom and foolishness, vigor and sloth in equal portions. And they appreciate sport. Arguably the most popular athletic sport today in the Intaki home systems of Placid, especially on the homeworld, is kendu kanarma, often simply called “kendu”. Kendu traces its roots to a Gallentean sport that saw its heyday of popularity several centuries ago and which was at its peak during the time of their first contact with the Intaki. Early Intaki civilization glorified cooperation rather than competition and the arrival of the Gallenteans with their strange customs and morals signaled a watershed moment in the development of the Intaki. It also signaled the beginning of their haphazard love affair with team sports. Whereas in most competitive sports played throughout the cluster, two or more teams square off and the emphasis is on striking the opposition, defending one’s own assets, and scoring more points, in kendu players thrive on the dynamic interplay between members of the same team. In kendu, victory is achieved by the team whose players’ actions are best synchronized and most complimentary to one another and it is virtually impossible for one player to achieve anything substantial on his or her own. This concept may be strange to foreign audiences, but it can be understood by examining the basic rules of play for kendu kanarma. Kendu is played between two teams, each having nine players on the field. The teams are told apart either by wearing uniforms like the professional players in the modern day leagues or, in the ancient style, by tying bands of colored ribbon around the forehead, upper arms, and thighs. Traditional kendu is played on a grass or dirt pitch one hundred meters long by sixty wide. 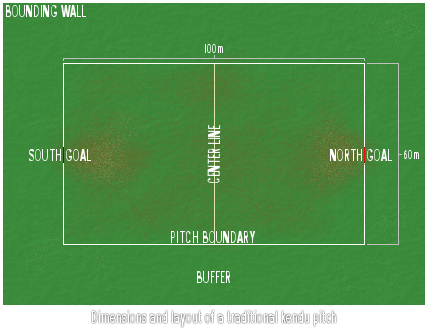 A buffer zone of twenty meters of cleared space typically extends around the pitch, and a short wall rings this buffer on professional pitches. Two teams of 9 players share two circular goals, each five meters in diameter, suspended one meter off the surface, and centered on either of the short sides of the pitch. One of the short sides of the pitch is determined to be “north”, while the other is “south”. The north goal ring is red and the south is blue. Two balls, one a prolate spheroid (the “vatama”) and the other an oblate spheroid (the “palandu”), classically made of sewn animal hide but today biofactured, are required for play. Most kendu leagues require the vatama to be 25 cm long and 57 cm in circumference and weigh between 380 and 410 grams with the palandu having similar size and weight. A game of kendu is divided into four segments, each seven minutes long. The segments are called “seasons” and are, in order, “candra, ravi, marut, and payas”. Every season begins with the two teams facing one another across the pitch, each lined up along one of the short sides. Each team possesses one of the balls, which they punt toward the opposing team to begin the season, starting the clock. A break, usually 5-7 minutes long, is enjoyed between seasons. A complete game of kendu can thus be played in a little over an hour. All players may move up and down the pitch freely and there are very few restrictions on how the balls may be moved. Both balls are in play at the same time and if one ball’s movement is stopped due to an out or advantage, the other remains in play. Balls may be kicked with the feet, struck with the hands, legs, torso, or head, or carried with the arms in any direction within the confines of the pitch. A ball that is in free play (not being carried by anyone) can be picked up or struck at any time by any player. Players may use any part of their bodies to strike a ball away from the arms of an opposing ball carrier. They may not attempt to take a ball away by grabbing it or by striking the ball carrier. Doing so results in a free run on that spot for the team in possession of the ball. If a player is able to completely arrest the movement of an opposing ball carrier and the carrier does not strike or drop the ball beforehand, it will result in an out. When carrying a ball, a player must “check” it on the surface of the pitch after every ten meters of movement. This can be done by dropping the ball and recovering it with the hands, bending down and touching it to the ground, or striking it from the hands with another body part and recovering it after it touches the ground. Failure to check a ball results in an out. If a ball leaves the pitch at any point, it results in an out on the team whose player last touched that ball. When an out occurs, the team to last have possession of the offending ball surrenders it to a player from the other team at the spot where the out occurred or at the spot where the ball left the pitch. The other team’s player may then take a “free run”, meaning he or she can strike the ball or run with it without direct interference from the other team. A player taking a free run must be given a one meter buffer by players of the other team until he or she has struck the ball or taken a step away from the spot of the free run. This buffer exists for ten seconds after the player takes possession of the ball at the spot of the free run. Afterwards, opponents are allowed to tackle the player or attempt to take possession of the ball directly. Opponents are always permitted to attempt to block a ball struck by a player taking a free run so long as they do not impinge on that player’s buffer. Scoring is achieved by two or more players acting in tandem. In order to score points, a team must first have “advantage”. Advantage is gained by passing either ball through either goal using “yamala”. Yamala involves a player in possession of either ball “setting up” by holding the ball with the hands in such a way that another player from his or her team can strike it with the feet, hands, or other body part. That other player must strike the ball so that it passes through either of the two goals. Neither the setter nor the striker need be standing still to accomplish this. Achieving this results in that team receiving advantage, either “advantage vatama” or “advantage palandu” depending on which ball was used. A ball that is used to achieve advantage is returned to play by the opposing team, who may take a free run with that ball from the center line of the pitch on either of its long sides. Retrieving and bringing such a ball back into play quickly is a hallmark of a team able to recover rapidly from the opponent’s taking advantage. If the opposing team has advantage, it can be taken away by performing yamala with either ball in either goal, after which the other team is said to “swing advantage” to their favor. A team with advantage may score points by performing another yamala, but they must do so by passing the other ball through the goal opposite the one used to create advantage. Thus a team with “advantage vatama north” must use the oblate palandu ball to perform yamala at the south goal. After a point is scored, the clock is paused, all advantage is reset and the teams return to the short sides of the pitch to kick off just as they do at the start of each season. Variants of kendu are played on many worlds within Placid and in small, widely-dispersed communities of the Intaki diaspora. “Agoze Rules” kendu is popular with many Intaki expatriates and incorporates slightly more violent tackling rules as well as two true spheroid balls rather than the unusually shaped vatama and palandu. On Intaki Prime, the sport has enjoyed a revival in recent decades and is one of the most widely appreciated athletic activities on the homeworld. Two large-scale leagues facilitate professional kendu, the traditional rules Intaki Premier League based on Intaki V and more commercialized Agoze Rules-based Major League Kendu headquartered in Ostingele. (Lately, Major League Kendu was forced to indefinitely suspended all of its regular season games after the devastating Sansha’s Nation raid on Ostingele in YC112. They are expected to return in the coming year.) In stark contrast to sports in other regions, even professional kendu players rarely become popular icons. This is perhaps attributable to the sport’s emphasis on coordinated team action rather than individual talent and showmanship. In Syndicate space, a sport called “kenduzana” has lately emerged and seems to be based loosely on kendu kanarma. Kenduzana is played in a spheroid arena and involves a shifting low-gravity environment. What is up and what is down changes depending on the swing of advantage and players are often encouraged to put on a show for paying (and betting) audiences. The Gentleman’s Book, a gambling consortium based in Poitot, sponsors a semi-professional kenduzana league and regular holovid special called Sfear that employs hundreds of Intaki Space Police and mercenary security officers as part-time athlete-gladiators. Sfear 19: Colossus, the latest series, drew record audiences for the sport in Syndicate and Guristas space with limited viewership in the Caldari State.